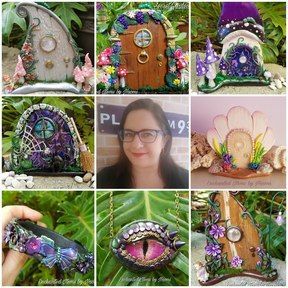 This Enchanted Fairy Tree House Scene is hand sculpted with Polymer clay using a painting with clay technique, giving this a 3D effect and making this a one of a kind piece. This makes a lovely keepsake for any Fairy lover. Size of the frame is 29cm heigh x 24cm wide. The Sculpted scene itself is approx. 12cm wide x 14 heigh. This Frame is ready to hang or display freestanding.